Being an architect, I’ve always been in love with the Art Nouveau scene of Vienna. 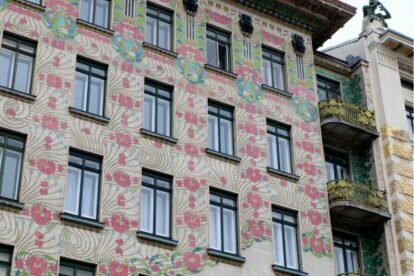 Otto Wagner has contributed a great deal of buildings to Viennese architecture, but also other prominent architects like Josef Hoffmann or Adolf Loos deserve a mention. It was back in 2008 (I had just started my studies in architecture at that time) when I first noticed the Majolika house on Wienzeile. If you have read my article about the flower shop Blumenkraft you already know that I am passionate about flowers and it might not come as a surprise to you that the Majolika house has stolen my heart. It’s like two things I absolutely love combined: architecture and nature. Allow yourself to take a broad look at the building. It’s like a gigantic flower! Whether you turn your attention to the actual facade, made out of thousands of tiles with flower motives printed on them, to the window lintels, which are richly decorated with blue blossoms themselves, or to the steel balcony railing, you’ll encounter the overall floral concept everywhere. Rumor has it that the inside of the building is gorgeous as well, especially the entry and the main staircase, but unfortunately I haven’t had the opportunity to see it myself. The houses on both sides of the Majolika house are from Otto Wagner as well and you might want to have a look at those too!